The ever-popular casino game of roulette probably doesn’t need much improvement; it’s been doing a pretty good job of tempting us to gamble for the best part of 300 years. However every now and again a developer comes up with a slight variant and that’s the case here with New AR Roulette from Playtech. Read on to find out what’s different about this version. New Ar Roulette is a lovely looking game and you feel as though you can almost tough the polished wood of the wheel as it slowly rotates. Shift your eyes down to the betting table and you will soon see the what’s different about this version. You will see two extra betting areas just by the chips labelled ‘Even + Red’ and ‘Odd + Black’. These are fairly self-explanatory and allow you to bet on all the red/even numbers and all the black/odd numbers. There are eight of each and a win will pay at 3/1. In this version of the game, a zero result will pay 2/1. Kick things off by selecting a chip size and placing it on your chosen spot on the betting table. There’s a minimum stake of $1 and the maximum will depend on your personal limit at the casino. If you’d like a more complex bet you can use the ‘racetrack’ to the right of the betting table and this will allow you to place ‘neighbour’ bets; these are groups of numbers based on adjacent positions on the wheel. 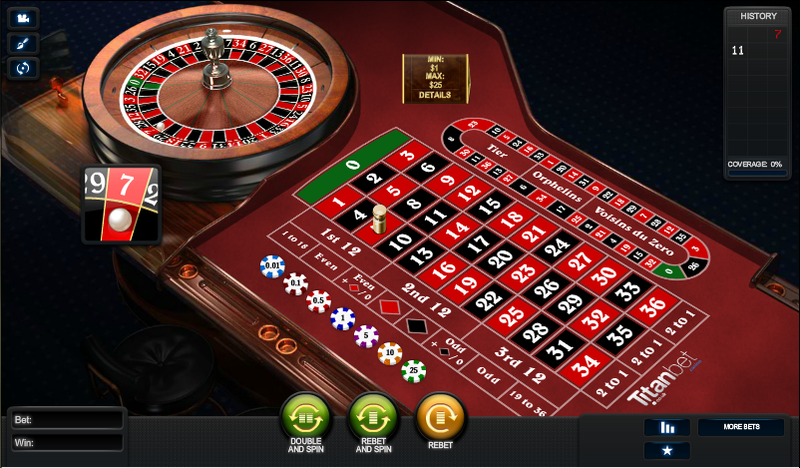 Read our comprehensive guide to roulette betting here. When you’re happy with your bets, press the ‘Spin’ button and away you go. The female voiceover keeps you company as the action takes place. When the spin is over any wins will be paid and you then have the option of using the ‘Double & Spin’, ‘Rebet & Spin’ or ‘Rebet’ buttons to move things on. The ‘Double & Spin’ option is interesting because it allows you to play the Martingale strategy quite easily. This is a nicely designed version of the game and we particularly like the betting information which pops into view when you hover over a betting zone. Also, anything which speeds up the strategy betting has to be good. The downside is the relatively low RTP of 94.60% which is lower than the bricks and mortar version.